However there is an organized effort to reduce these 30,000 deaths to zero, and that effort is called Vision Zero — a collaborative strategy aimed at eliminating traffic fatalities and severe injuries. First implemented in Sweden in the 1990s, Vision Zero has proved successful in reducing traffic fatalities across Europe and is now being adopted by cities all across America. Read on to find out what Vision Zero is, how Vision Zero Cities in the United States have increased traffic safety and how your city can take the necessary steps toward becoming a Vision Zero City. With the majority of traffic deaths and injuries happening at the local level, most city leaders know their transportation systems are dated and in need of significant structural and technological updates. The goal of Vision Zero is to bring together these local leaders to share successful strategies, product implementations and to support leadership for policies and practices to eliminate traffic fatalities while increasing safe mobility for vehicles and pedestrians alike. Reversing from the traditional approach to traffic safety which focuses on trying to perfect human behaviors through testing, education and media campaigns (which can be successful), Vision Zero focuses on the system as a whole, not simply the driver's role in it. Since you can't perfect human behavior, Vision Zero redefines the traffic safety dilemma by identifying true problem areas as a combination of roadway design, enforcement, technologies, behaviors, polices and speed management. It's well known reducing vehicle speed increases roadway safety. Vision Zero works with forward-thinking communities to focus on speed management in an effort to reduce speeds — and ultimately save lives. The National Highway Traffic Safety Administration considers a crash to be speed related if any driver in the crash was charged with a speeding-related offense that was a contributing factor in the crash. Of the 35,000 traffic fatalities that occurred in 2014, 28 percent were due to speeding. In order to reduce speeds to safer levels in problem areas, Vision Zero cities have installed Rectangular Rapid Flash Beacons and Radar Feedback Signs, and sometimes have completely redesigned roads with Road Diets — all in an effort to increase safety. 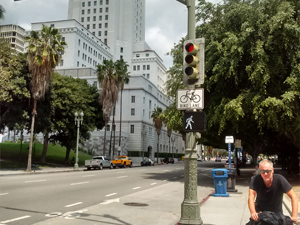 Los Angeles committed themselves to Vision Zero in August 2015 and have since installed twenty-two new Leading Pedestrian Intervals (LPIs) throughout the city among other projects. 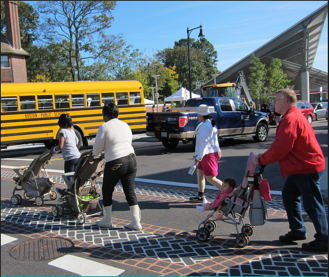 Leading Pedestrian Intervals give pedestrians a 3-7 second head start when entering intersections. LPIs have been proven to reduce pedestrian vehicle collisions by as much as 60 percent and are ideal for intersections when turning traffic often comes in conflict with crossing pedestrians. With the success of projects just like these, the Los Angeles City Council recently approved more than $27 million to Vision Zero efforts for the 2017-2018. Check out the full list LA's future Vision Zero projects here. Boston committed in March of 2015 and immediately turned their focus on the Green Links Program, which connects every neighborhood to the city’s extensive park and green way system. The system is helping to produce low-stress, traffic calmed streets and local trails. Boston has dedicated an additional $17 million for the 2018 Fiscal Year towards programs such as Priority Corridors and Safe Crossings. 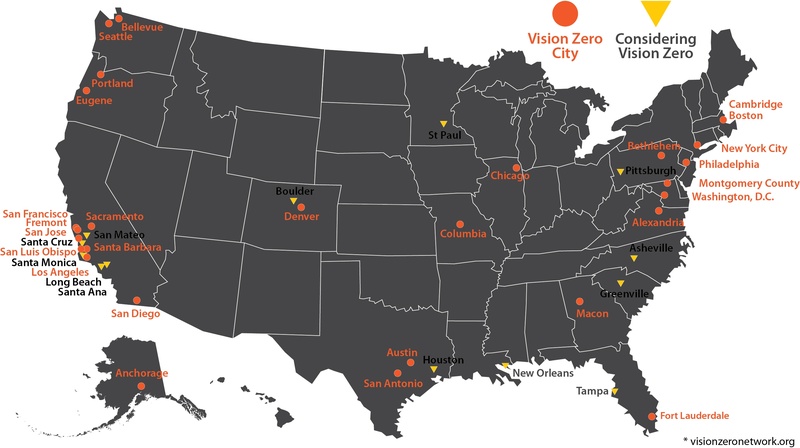 From Los Angeles to New York City, to Chicago to San Antonio, major communities are committing to Vision Zero so they too can achieve zero deaths from traffic collisions. The following cities on the map below are committed to Vision Zero with others considering Vision Zero. TAPCO assists many Vision Zero Cities with guidance and innovative technologies that increase traffic safety in their neighborhoods. That's why we've created the guide, How to Commit Your City to Vision Zero so you can learn what it takes to get your city aligned with the rest of the Vision Zero Community.